I eat a LOT of salads. On busy days (which is most days) a big salad is my only true meal and by dinner I have a lot of nutrient making-up to do. 10 – 12 servings of fruits and veg is a lot, but totally do-able if you’re into (or get into) superfoods and salads. Your nutrient intake will be high and you will certainly be healthier for it. I make a salad almost every day and I’ve made some pretty unconventional mixes with many combinations of ingredients. I’m always adding interesting textural qualities and different flavors so that I don’t get bored. In my world, salad is the new sandwich, an easy go-to but gluten-free and nutritionally dense. I often get questions and comments about the salads that I post on Instagram and I want to share some methods, tricks, recipes and nutritional information to make salads easy, accessible and appealing to everyone, even the green-o-phobics out there. Salads can have one or two fresh ingredients for a “side” or a “starter”, or they can have many ingredients making the salad a meal itself. Biologically it makes sense to have some bitter greens and vinegar, lemon or lime juice before or during every meal, as the bitter quality and the acidity will stimulate digestive juices and bile production, both required to digest fats and proteins. Raw vegetables and fermented foods also contain active enzymes, where cooked foods do not, so eating something live and fresh, like a salad, at every meal can assist in proper digestion and nutrient absorption while also raising overall nutrient content. When I first began thinking about, writing about salad, I asked myself what my favourite, or the most important salad component is. I was sort of back and forth with potential favourites and then suddenly, so clearly, I had it; SALT. It might seem silly, but it’s totally true! High quality, unrefined salt is the most important ingredient in every salad I have ever made. All the other ingredients can be switched out, even the oils, acids and herbs can be swapped or omitted, but salt must always be there, or it just isn’t right. THEN, when I began researching the history and etymology of salad, I discovered that the word “salad” comes from the French word salade, which comes from the Latin word salata, from the other Latin word sal or . . . SALT! How cool is that?! (I was probably way too excited when I discovered this). In Ancient Roman times salads were seasoned, just as they are today, with salty oil and vinegar dressings, and so the humble salad got it’s name (and my favorite salad ingredient was affirmed historically). High quality salt is traditionally given as a housewarming gift in Eastern Europe and Hindu cultures. But why is salt so important in salads? First and foremost, quality salt makes raw vegetables, and most foods, much more flavorful. A couple of times I have forgotten to add salt, and a bite or two in it is very apparent that something is missing. Salt takes flavors from flat and dull to vibrant and lively. Salt also stimulates appetite and aids in the digestion of vegetables, proteins, grains and almost all other foods. Salt acts as a natural preservative, keeping your salad from turning brown and soggy as quickly. Energetically, salt is considered the most grounding of any food substance . This makes sense when you consider where salt comes from – the depths of the ocean or deep deposits in the ground.Salads tend to have lighter and airier components, salt would stabilize these elements and draw them in lower, grounding them in the body. At times the salads I make can seem chaotic in their ingredients and I have found that salt is always the ingredient to bring everything together. 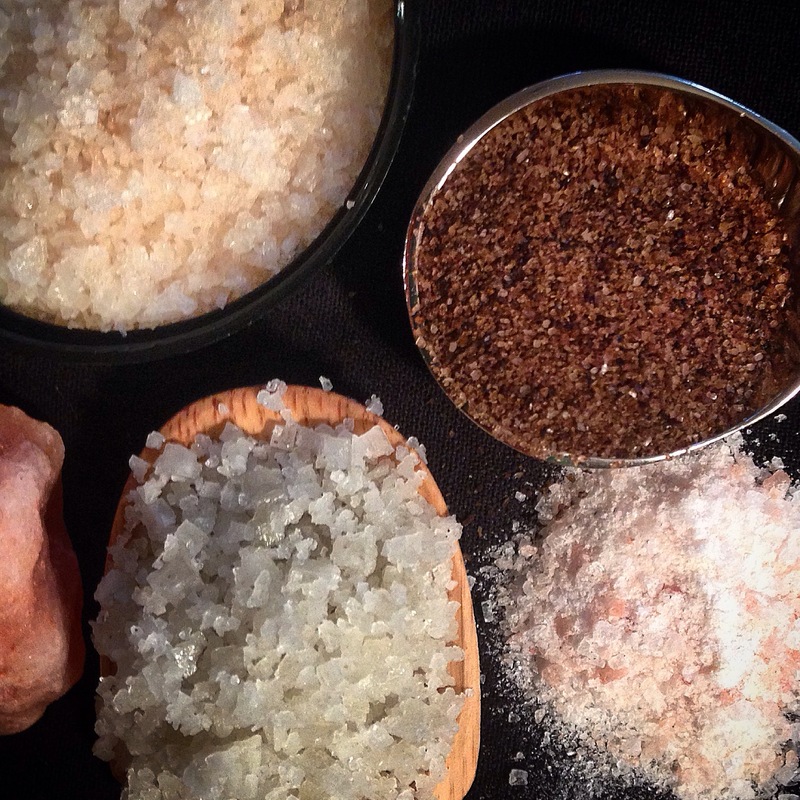 I eat unrefined Icelandic sea salt, Himalayan pink salt and a couple of other well sourced, unrefined, sea salts. I encourage you to do a bit of research or check out your local health food store, organic grocer or spice shop, ask about your options and learn a few things. Pick up some AMAZING salt and the next time you eat a salad or some raw or cooked veggies sprinkle some of that good stuff on there. If you are still of the thought that salt is “bad” for you, I encourage you to read “Lemon Water Revitalize” or pursuing other articles that speak to the benefits of quality salt in the diet. You’ll find that it isn’t salt that is “bad”, but rather the type of salt.